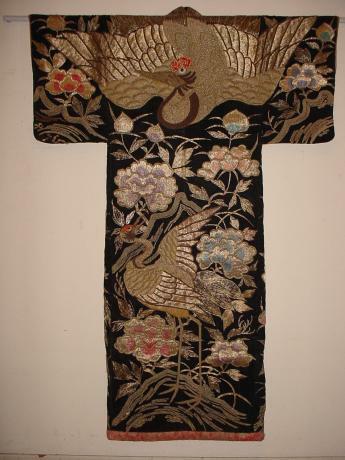 Japanese Meiji Period TSUTSUGAKI KIMONO shaped FUTON cover. Done in the bold design of a huge family rest on the back shoulder above a pair of cranes standing amongst pine, bamboo and plum blossom. The front has a chick and more pine, bamboo and plum blossoms. 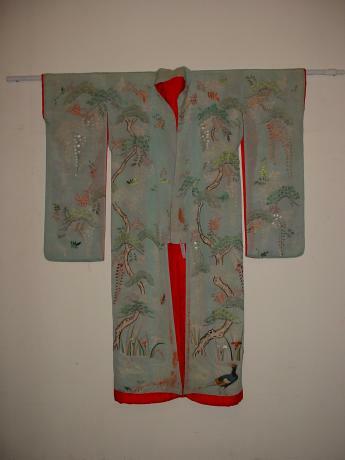 50" across from sleeve to sleeve,..
Japanese Meiji Period CHIRIMEN silk KIMONO. The wonderful KIMONO has a meandering stream and flowers. 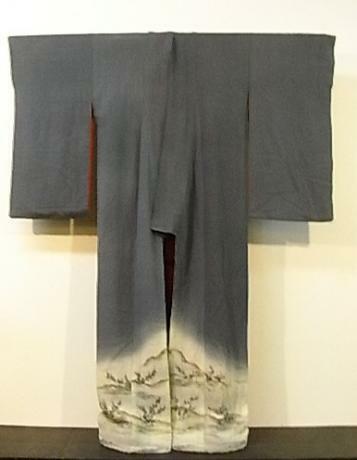 The KIMONO has light padding inside and at the hem. The KIMONO measures 48" from sleeve end to sleeve end, 23 1/2" from underarm to underarm. 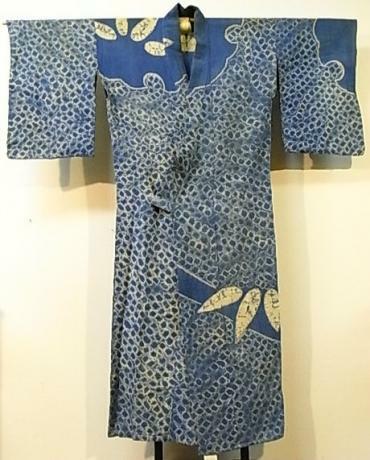 The sleeves measure 28 1/2" long and the KIMONO meas..
Japanese early 20th century cotton KIMONO. The wonderful bamboo design has been done in SHIBORI, the tie-dyed process made famous in Japan. The KIMONO measures 47" from sleeve end to sleeve end, 24" from underarm to underarm. The sleeves measure 19 1/2" long and the KIMONO measures 53" long. 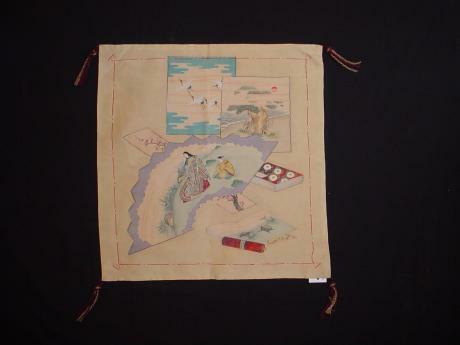 S..
Japanese Early Showa MUSO summer HAORI with KOI, maple leaf and wisteria design. The HAORI is made of a translucent summer fabric and is to be worn with the solid black side out, showing just a hint of the colorful design within as the wearer moves. The HAORI has a single family crest on the bac..
Japanese Meiji Period FUKUSA. Done in the YUZEN, paste resist dyeing and handpainting technqiues. Additional detailing is done with embroidery, such as the tastles of the noblewoman's fan and the cord on the handscroll. Design is of fan design, FUKUSA design and painters sample book and handscr..
Meiji Period stage costume. 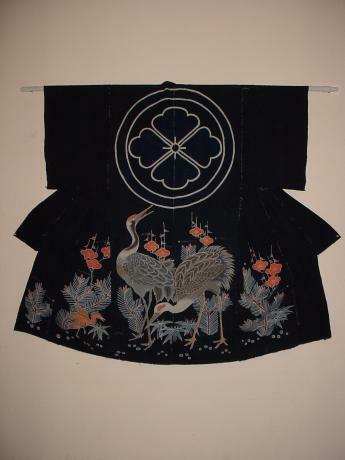 Black velvet with heavy embroidery KIMONO and MAE KAKE, decorative apron. Bold and wonderful design of huge crane on back of KIMONO with other crane and poenies on front and SHISHI, lion with peonies on apron. 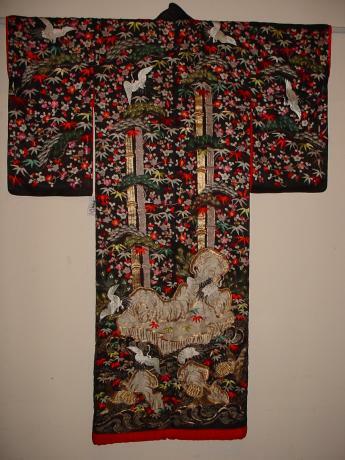 KIMONO measures 50" from sleeve to sleeve, 24" across bod..
MEIJI Period black embroidered FURISODE KIMONO. 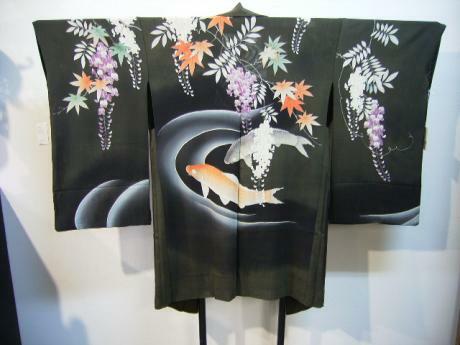 The design of the KIMONO is of 3 friends, pines, bamboo and plum blossoms as well as Crane and Tortoise. 48" width by 64" long. The body is 24" in width and the sleeves measure 26" long.